boy image created under Don Cherry's tenure. Good boy, bad boy, it was still a losing team. returned to the bench when the move to New Jersey was final. of the season, but it fell flat quickly. University Cup Final Four in 1991, losing in the semifinals. 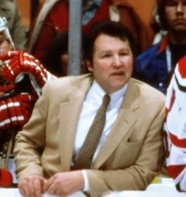 in both the NHL and on Team Canada for the 68 Olympics in Grenoble.